Bedding Information: 2 Twins. 2 Queens. Pool with quiet, redecorated home. 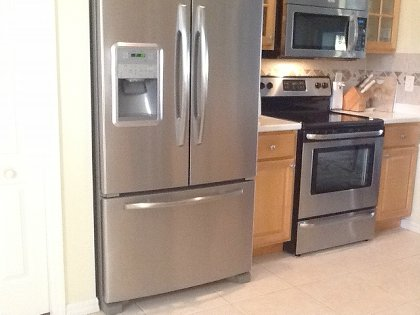 Nearby GREAT Shopping of all kinds; grocery store and several restaurants within a 4 minute drive/ 20 minute walk- (2 miles) all you need within walking distance; also short drive to the beach! We will be booking again. We felt secure and loved the convenient location. 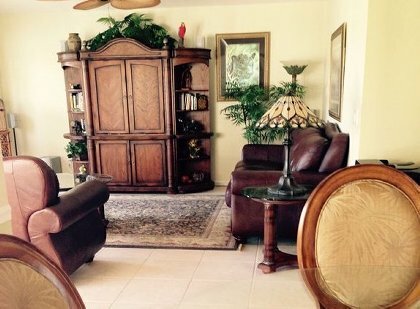 The home was immaculate, and very well maintained, quiet and well stocked. The price was very reasonable for the amenities and quality offered. Better than Home Sweet Home! Loved the place and will return. Felt Secure and location was perfect for us- close to everything we wanted- Beach, shopping and restaurants. Convenient and quiet and peaceful. Really priced reasonable for the contents being so nice and very clean and top notch. very nice. Better than home! The place was top notch, mint condition and we enjoyed the pool and jacuzzi and lanai very much. All in great condition and better than we expected! Location- PERFECT! Shopped at all 3 closeby centers. Locoation was perfect for us- close to everything we wanted to visit, including Beach, restaurants, shopping and theater. Poolside - nice view of golf course, quiet and peaceful. 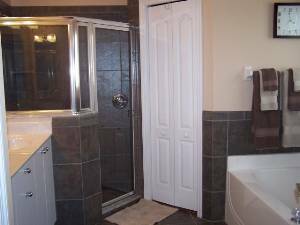 House was immaculate and very well maintained, very comfortable beds and convenient, cozy layout. Definitely will return- very good value for the price. with it. It was great to have a pool on our doorstep and be able to laze about for half of the day. Our wives did well with their shopping at Coconut Point, Gulf Coast Town Centre and Miromar. other courses in the area. both Coconut Point and at Gulf Coast Town Centre. always quite cheery, took a look at the permit and waved us through. We always talk about trying water sports and usually don’t do this. great big steaks from Publix at a fraction of the UK cost. Wir haben einen schönen Golfurlaub in Stoneybrooks verbracht. Alles war super in Ordnung. Sehr schönes Haus mit Allem was der Mensch (Golfer) braucht. This villa was lovely and extremely clean. it has everything you could wish for in a villa and its situation was excellent for visiting other places. we had never rented a villa before so we were abit wary about how clean and well worn it would be but it was immaculate. i would recommmend this villa to anyone. one thing is that i agree with the other comment that another lounger would be better but the patio furniture is so nice you dont let it bother you. would like to go back again soon. I wanted to write to you and let you know that I could not have found a better place to vacation. I felt so comfortable and at home, the house is beautiful, very relaxing, modern, and so clean. 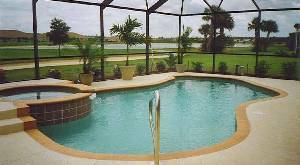 There was so many features that I liked about the villa just to name a few; the pool and jacuzzi was so easy to use. The digital wall mount next to the sliding glass door was so easy to use and very self explanitory. The lights at night in the pool and jacuzzi was spectular. All of the dishes, pots and pans, uteinsals etc., there was so many! Another highlight of the house was the wonderful choice of decor, it is just amazing. The bedrooms are so spacious and very comfortable. Also, there was so much to do for example, the beach is just 10 minutes away, the huge shopping outlets across the steet, the restrauants, and the wonderful information and suggestions you provided was a big help. One more thing, I wanted to personally thank you, my flight was late coming in eventhough the airport is just 15 minutes away I had forgotten some personal items. When I walked into my bedroom I had found a basket of personl items like shampoo, toothpaste, soap etc... That to me, was a bonus that I did not expect to find. The next day I went to the supermarket across the street, which was very convienant and bought my personal items. I will definately be back next year, and I recommend this villa to everyone. Thank you so very much Charlotte!!!! hope that you are enjoying your new plant out front. My mother has a green thumb here in Maine! Take care and THSN YOU! We must say, this was one of THE best vacation homes we have rented! Pictures don't do the home justice-this is a MUST SEE! We were impressed by just about everything the area had to offer: outlet shopping across the street, hockey games at the TECO arena just 5 minutes away. There's really something for everyone there. My wife enjoyed her evenings relaxing by the pool & taking a dip in the jacuzzi. I have to say, my favorite time by the pool was spent in the early mornings w/a cup of coffee, watching the golfers and catching the "resident" eagles' flight across the greens! You're going to love it, trust me. Just a short note to acknowledge our appreciation for the lovely holiday we have just had at your villa. The villa was more than adequate, beautifully furnished, and the swimming pool and spa complemented what was for us the ideal location. Having the barbeque located adjacent to the patio furniture made it the ideal spot for early evening dining as the sun went down. 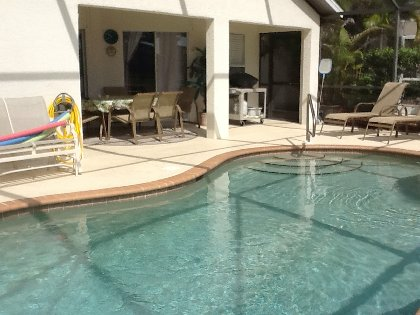 The villa was ideally located in a very central position and within easy reach of shops, beaches, restaurants, and being located close to both the I75 and 41 meant that both Naples and Ft. Myers were only a short drive away. With the access to I75 being so handy we took advantage and drove to both Miami and the Florida Keys (just beyond key largo) on seperate days, which was well worth the visit. The facilities within the community were excellent, and both my son and myself took advantage of the golf and tennis facilities. As my son is a keen swimmer he also took advantage of the junior olympic pool to swim every other morning. We also found the facilities at the Golf Clubhouse very good, and would recommend the bar or restaurant for a quiet drink or evening meal. Overall I cannot think of anything that you have missed when fitting out the Villa, (perhaps one more lounger at the pool would be an enhancement, as my wife thought the patio furniture was beautiful and as comfortable as it gets), and I would have no hesitation in recommending your accommodation to anyone that was thinking of having a holiday in this area of Florida. Once again I would like to thank you for the professional way that you handled our arrangements, which helped contribute to a very pleasant and relaxing Holiday. Just a short note to acknowledge our appreciation for the lovely holiday we have just had at your villa. The villa was more than adequate, beautifully furnished and the swimming pool and spa complemented what was for us the ideal location. Having the barbeque located adjacent to the patio furniture made it the ideal spot for early evening dining as the sun went down. 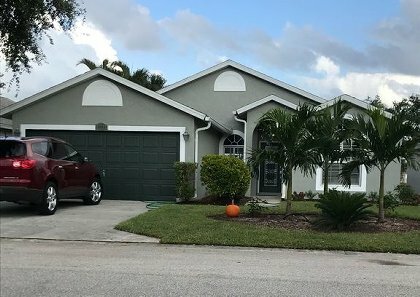 The villa was ideally located in a very central position and within easy reach of shops, beaches, restaurants, and being located close to both the I75 and 41 meant that both Naples and Ft. Meyers were only a short drive away. With the access to I75 being so handy we took advantage and drove to both Miami and the Florida Keys. (Just beyond Key Largo) on separate days, which was well worth the visit. The facilities within the community were excellent, and both my son and myself took advantage of the golf and tennis facilities. As my son is a keen swimmer he also took advantage of the jr. Olympic pool to swim in every morning. We also found the facilities at the Golf Clubhouse very good, and would recommend the bar or restaurant for a quick drink or evening meal. Overall I cannot think of anything you have missed when fitting out the Villa, (perhaps one more lounger at the pool would be an enhancement, as my wife thought the patio furniture was beautiful and as comfortable as it gets.) 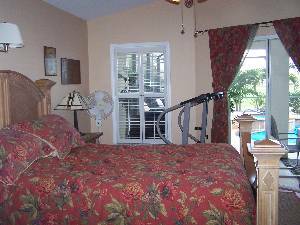 And I would have no hesitation in recommending your accomodations to anyone that was thinking of having a holiday in this area of Florida. Once again I would like to thank you for the professional way you handled our arrangements, which helped contribute to a very pleasant and relaxing Holiday. Cancellations and Refunds: E-mail us for a rental agreement.